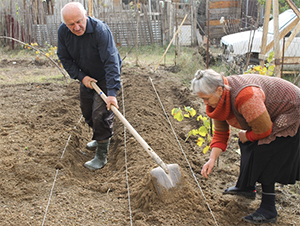 Economic Development through Agricultural Assistance for IDP Farmers in Kvemo Kartli and Kakheti regions (EDKK) is a comprehensive program with a three-prong approach to create economic vitality within IDP communities. Through EDKK, RDFG staff work to reduce poverty and improve social inclusion of IDP families by teaching modern farming techniques and funding agricultural economic development opportunities in the Kvemo Kartli and Kakheti regions. The project also engages youth in civic leadership and livelihood development in rural areas. Members of the IDP community and the host village are able to participate in trainings on innovative farming techniques, business development and value-chain operations. IDP farmers are invited to submit a business proposal, and a portion of them will receive funding to fulfill their agro business plan. Local farmers can then visit these new or expanded businesses to see the modern agro technologies demonstrated. The Young Famer Centers (YFC) teach leadership skills, new farming techniques and community engagement in order to cultivate future farmers and active citizens. Too many youth are leaving their communities to pursue economic opportunities in the cities; YFC works to reverse this trend by teaching advocacy, civic participation and agricultural innovation so youth can revitalize their communities’ civic and economic future. Young Farmers Centers also participate in demonstration plots and learn entrepreneurial skills. RDFG will secure a sizeable plot of land in the Kvemo Kartli region, and invite farmers from the IDP and host communities to demonstrate modern industry techniques through a collection of agro and non-agro projects. Projects will include crops grown in open field and greenhouses and non-agro demonstrations of energy-saving technology in housing, heating, etc. as well as alternative or renewable energy. Demonstration Village participants will sell their products in local markets using business skills and relationships they learn through RDFG. At the Demonstration Village, RDFG will establish Farmer Regional Information Centers (FRIC) to create capacity building, promote social networking among IDPs and the host community, and match business opportunities to smallholder farmers and youth. EDKK is funded by the German Federal Ministry for Economic Cooperation and Development (BMZ) and supported by World Vision Germany, and runs from January 1, 2016 to June 30, 2018.